Our biological clock regulates various daily rhythms, such as sleep/wake rhythm, body temperature, and metabolism. Disruption of the circadian rhythm may lead to sleep disorders, cancer and other diseases. Profs. 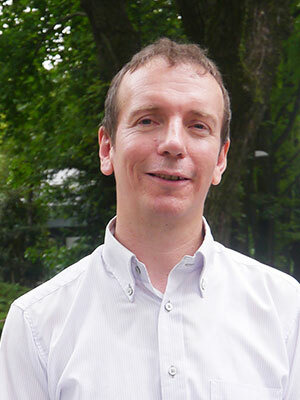 Kenichiro Itami, Takashi Yoshimura, Stephan Irle and colleagues at ITbM have come together to discover for the first time, a rhythm-changing molecule with period-shortening activities that targets the clock protein, CRY, which open doors to molecule-based solutions for circadian-related diseases and improving food production in animals. Nagoya, Japan - A team of chemists and biologists at the Institute of Transformative Bio-Molecules (ITbM), Nagoya University have succeeded in finding new molecules that change the circadian rhythm in mammals by applying synthetic chemistry methods, which makes use of highly selective metal catalysts. Most living organisms have a biological clock with an approximately 24-hour circadian rhythm, which regulates important body functions such as sleep/wake cycles, hormone secretion, and metabolism. Disruption of the circadian rhythm by genetic mutations and environmental factors, such as jet lag, may lead to sleep disorders, as well as lifestyle diseases such as obesity, cancer and mental disorders. The circadian rhythm is also related to seasonal reproduction, where animals use their biological clock to sense the time of spring and start their reproductive activity. 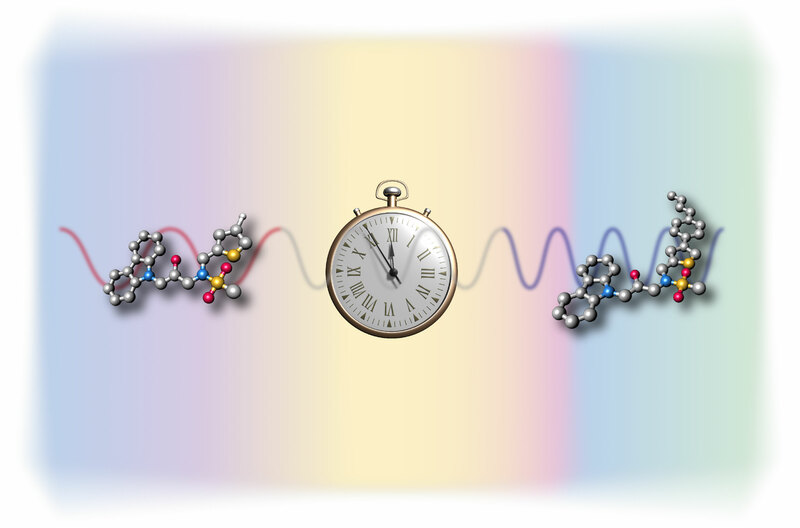 Through the interdisciplinary collaboration between synthetic chemists, chronobiologists and theoretical chemists, researchers at ITbM have discovered the first circadian period-shortening molecule targeting the clock protein, CRY. The study, published online in Angewandte Chemie International Edition, shows the power of synthetic chemistry to rapidly synthesize and tune the activity of circadian rhythm-changing molecules. Critical sites on the molecules for bioactivity have been uncovered and both period-lengthening/-shortening molecules have been utilized to investigate the regulation of the clock protein in the body's timekeeping mechanism. The outcome of this study is expected to be useful for developing further efficient molecules that can control the circadian rhythm in mammals, which may overcome various circadian-related diseases and control reproductive activity in animals to provide solutions for food production. Circadian clock research has accelerated rapidly since the discovery of clock genes in the 1990's. By genetic and molecular biology approaches, it has been found that the circadian rhythm in mammals are mainly controlled by circadian clock genes/proteins, which are called Clock/CLOCK, Bmal1/BMAL1, Per/PER and Cry/CRY. The mechanism of the circadian clock works by circadian clock proteins CLOCK and BMAL1 heterodimers binding to a genetic sequence called E-box (CACGTG), which is located at the upper region of Per and Cry genes, thus promoting transcription to their respective proteins. The PER and CRY proteins then forms a dimer, which binds to their transcriptional activators CLOCK and BMAL1, thus inhibiting the promotion of Per and Cry transcription. Activation and inhibition by the clock proteins constitutes a feedback loop, which goes around once a day, thus generating the 24-hour circadian rhythm. 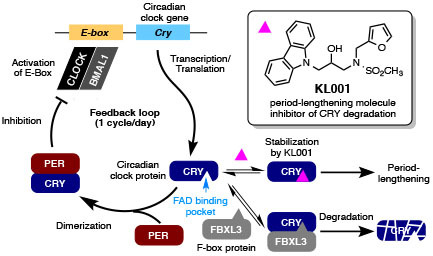 FBXL3, an F-box protein that constitutes ubiquitin ligase complex plays a balancing role in the circadian rhythm by binding to a pocket on the CRY protein, called the flavin adenine dinucleotide (FAD) binding pocket, promoting the degradation of CRY. "Very few molecules have been known that directly acts upon clock proteins and controls the circadian clock in mammals," says Tsuyoshi Hirota, a chronobiologist and an associate professor at ITbM, who works with Steve Kay, a principal investigator at ITbM and a professor at the University of Southern California. "In 2012, we reported the discovery of a molecule, KL001 that directly targets the clock protein, CRY and lengthens the period of the circadian rhythm in human cell lines." KL001 is a small molecule that was found from the screening of about 60,000 compounds. This molecule exhibits period-lengthening activities by binding to the FAD-binding pocket of CRY in competition with FBXL3. "As we were interested in knowing how the molecular structure of KL001 affects the circadian rhythm in animals, Steve and I were very happy to become part of ITbM to collaborate with researchers from various fields," continues Hirota. 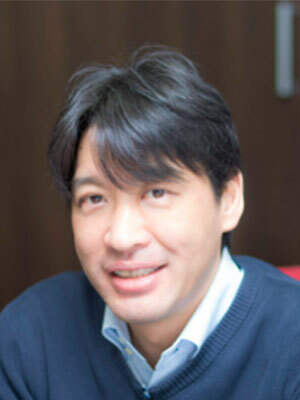 "We decided to look into this issue of how small molecules affect the circadian rhythm and how we can generate new bioactive molecules by making a team of scientists specializing in synthetic chemistry, catalytic chemistry, chronobiology, animal physiology and theoretical chemistry, about two years ago from now," says Kenichiro Itami, a synthetic chemist and the director of ITbM, who is one of the leaders of this research. "Tsuyoshi rapidly synthesized over 50 derivatives of KL001 by applying the C-H activation chemistry developed in our group. 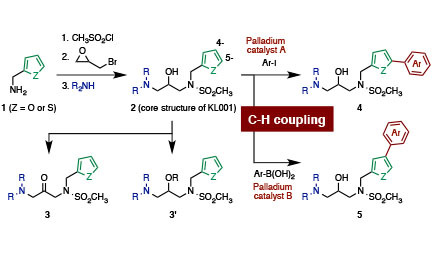 Our original palladium catalysts enable selective installation of functional groups at the desired positions on the heteroaromatic ring." Tsuyoshi Oshima is a graduate student in Itami's group and worked closely with the biologists at ITbM to synthesize molecules for studying structure-activity relationships (SARs). 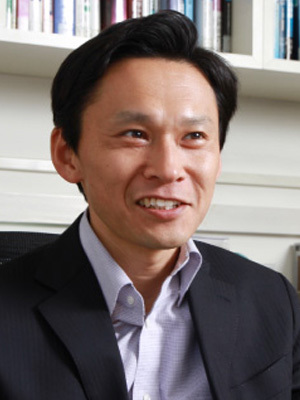 "Through SAR studies on the molecular derivatives of KL001, we found the critical sites on the molecule for rhythm-changing activities, and succeeded in discovering active molecules that lengthens or shortens the period of the circadian rhythm," says Takashi Yoshimura, an animal biologist and professor at ITbM, who also led this research from a biological perspective. 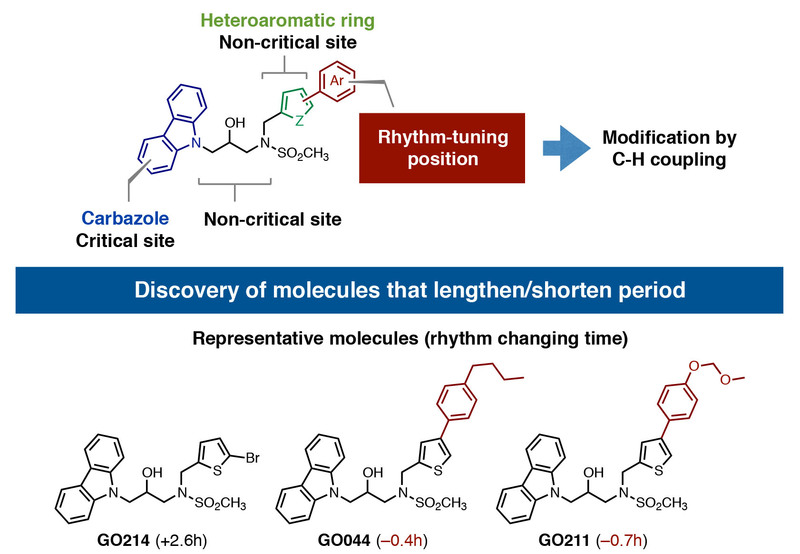 "It was found that the carbazole moiety was critical for rhythm-changing activity and that the substituents on the heteroaromatic ring are responsible for tuning the rhythm lengthening/shortening activities," continues Itami. "By putting the rhythm tuning installation step at the end of the synthetic scheme, we were able to rapidly synthesize a pool of bioactive molecules." "As we wanted to know the mechanism on how our synthesized molecules act on the clock protein, we next took a look at how the KL001 derivatives bind to the CRY proteins by performing docking simulations," says Stephan Irle, a theoretical chemist and a professor at ITbM, who also co-led this research. "We found that the KL001 derivatives function by binding to the CRY protein at the same FAD-binding pocket as KL001 and FBXL3." Quantitative structure activity relationship (QSAR) studies on KL001 derivatives with the CRY protein conducted by Irle's group have revealed meaningful relationships between molecular structures and bioactivity. "Our investigations reveal the possibility that there may be other CRY-mediated period-shortening regulatory mechanisms yet to be discovered. Through further studies, we would like to find how small changes in the molecular structure lead to opposite rhythm changing activities," says Irle. "We are extremely pleased that C-H activation chemistry has played an important role in finding bioactive sites in KL001 derivatives and has also led to the discovery of molecules that act on the CRY clock protein and shorten the period of the circadian clock rhythm. This is my first research outcome from the center's interdisciplinary collaboration between chemists and biologists, which was made possible by ITbM's unique research environment," says Itami. ITbM was officially established in 2013 at Nagoya University and takes up a "Mix-Lab" style where chemists and animal/plant biologists from different research groups work in the same lab space. "We hope we can make further use of synthetic chemistry to make bioactive molecules that can control the circadian rhythm of animals and gain further insight into the circadian clock mechanism, which will surely contribute to medical applications, food production and advances in clock research. This has been a wonderful experience for me to work with chemists and we will continue to work together for more exciting results to come," says Yoshimura. 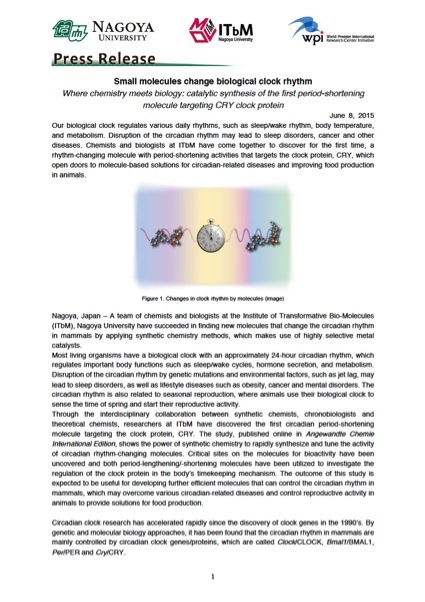 "C-H Activation Generates Period-Shortening Molecules That Target Cryptochrome in the Mammalian Circadian Clock" by Tsuyoshi Oshima, Iori Yamanaka, Anupriya Kumar, Junichiro Yamaguchi, Taeko Nishiwaki-Ohkawa, Kei Muto, Rika Kawamura, Tsuyoshi Hirota, Kazuhiro Yagita, Stephan Irle, Steve A. Kay, Takashi Yoshimura, Kenichiro Itami is published online on May 8, 2015 in Angewandte Chemie International Edition.